Named after local landowner Oscar F. Stair. The town came into being in the 1920s - just after the discovery of Edgar Davis' Luling oilfield. The proximity to Luling dictated that Stairtown would never thrive - and after the derricks were built there was little need of a work force. The workers left behind a few houses and fewer businesses to cater to some 20 people. The town did appear on maps in the 1940s but has since been removed. Thirty-five has been the estimate since the 1960s. 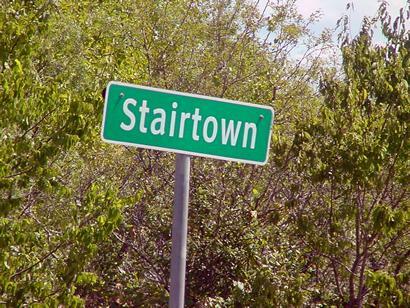 "I was amazed to see anything on the web about Stairtown, Texas. The town was founded by my grandfather Oscar F. Stair, born in 1867. The family still owns a part of the townsite (mostly populated by Mesquite trees). Grandfather came from Bristol, Tennessee to Prairie Lea, Texas via Alabama. When he was a boy he moved to Luling and founded Stairs Store. It was a dry goods/ grocery / hardware store and operated into the late 1960s, managed by my Uncle Neal Stair. I currently reside in faaaaar West Texas."